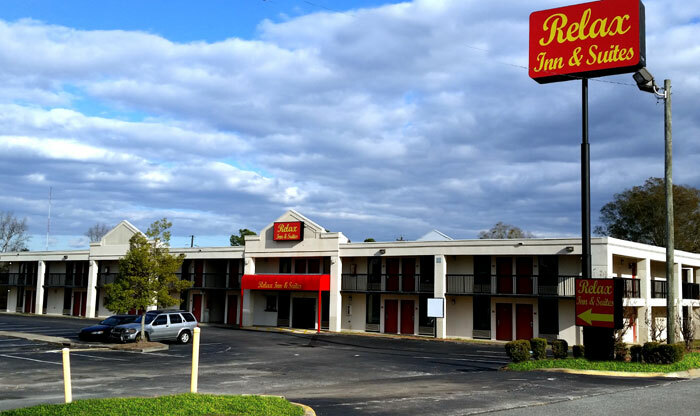 Relax Inn & Suites is located in Historic Dublin Georgia in a beautiful and relaxed surrounding with nearby restaurants and shopping for your convenience. Free parking is available along with Bus and Truck parking in the back. Clean comfortable rooms including some suites are also available. Welcome to Dublin, The Emerald City and Laurens County, where small town Southern charm and the determination to keep Dublin Laurens County Green and Growing have combined to create a community rich in character and full of life. Our Dublin Laurens County Chamber of Commerce website features Chamber Members as well as access to important area information. Come experience firsthand the genuine Southern hospitality here in The Heart of Georgia, where everyone works together to make our community a better place to live, work, play and retire. Activities : The mild climate of Dublin Georgia creates a wonderfull haven for those who enjoy tennis, golf, fishing, or hunting. Discover the numerous parks, state-of-the-art sporting complexes and our equestrian center. Airport : W H 'Bud' Barron Airport 675 Airport Road, Dublin, GA 31021 (478) 275-0029 Fax: (478)275-1352 dublinservice@bellsouth.net Dublin Air Service Inc. is a fixed base operation located at the W.H. (Bud) Barron Airport in the heart of Georgia country in Laurens County. We service general aviation air traffic from all over the Southeastern Region of the United States. Attractions : Minutes off exit 51 on I-16, Dublin stays ahead of the curve with award-winning dining, performing arts, natural escapes, and rich history. Dining : Delight in Dublin GA and nationally acclaimed dining where Georgia's best pizza, fine cuisine, and casual eateries fuse, providing an unexpected diversity of flavor minutes off I-16 at exit 51. Golf :Riverview Golf Course 100 Riverview Park Drive, Dublin, GA 31021, United States (478) 275-4064. Bordering the Ocmulgee River, Riverview Park Golf Course in Dublin, GA is an 18-hole public golf course located minutes off 1-16 at exit 54. Opened in 1977, Riverview features 6,161 yards of golf on lush Bermuda with a par of 72 with pro shop, cart and club rentals, and lessons. Riverview Park Golf Course measures 6,161 yards from the longest tees and has a slope rating of 120 and a 69.1 USGA rating. The course features three sets of tees for different skill levels. Government : Welcome to Dublin, "The Emerald City," and Laurens County, where small town southern charm and a determination to keep Dublin-Laurens County "Green and Growing" have combined to create a community rich in character and full of life. Hospitals : Fairview Park Hospital 200 Industrial Boulevard Dublin, GA (478) 274-3100. Fairview Park Hospital is a leader in healthcare for the City of Dublin, Laurens County, and the surrounding communities. Fairview Park is a state-of-the-art, 190-bed acute care facility providing community healthcare services including a 24-hr Emergency Room, inpatient and outpatient surgery options, and rehabilitation therapy services. In addition, Fairview provides specialty services through facilities such as the Sleep Center at Fairview Park, the Same Day Surgery Center, the Heart Center at Fairview Park, and the Women's Imaging Center. Shopping : From antiques and eclectic collectibles to exclusive boutiques and classic fashions, discover a world of shopping delight right here in Dublin, GA.
University : Middle Georgia State College 100 College Station Drive Macon, GA 31206 478.471.2700. The mission of Middle Georgia State College is to serve the educational needs of a diverse population through high quality programs connected to community needs in a global context and to serve as a leader for the intellectual, economic, and cultural life of the region.